I have also included a simple welcome page that opens when the user clicks on the “GO” button. You can download all these files (.zip file) at the end of this article. In the package is also included the PSD file (with some small changes). So, now I’m going to explain what these files do. You can view a demo of the login form HERE. 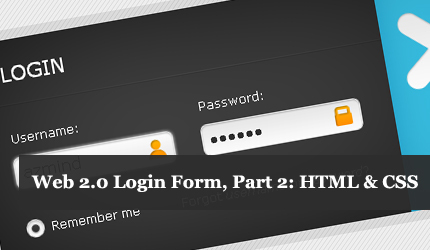 There are two html files in the package: index.html for the login form and welcome.html for the welcome page. The browsers that support CSS3 don’t need these libraries for displaying the custom checkbox. The “body” part contains the “container” for the login form and the “footer” for displaying some credits. As you can see in line 24, when the form is submitted it opens the welcome page. Something important to mention here is that in the lines 28 and 31 I have wrapped the input fields within a “div”. This is for adding custom backgrounds to the username and password input fields. Yes, I can add the backgrounds directly to the input fields, but in this case the “padding-right” doesn’t work as I want it to (I’m using Chrome 16 and Windows XP). In the beginning (line 11) you can see the CSS reset from Eric Meyer, http://meyerweb.com/eric/tools/css/reset/. “The goal of a reset stylesheet is to reduce browser inconsistencies in things like default line heights, margins and font sizes of headings, and so on.” – from meyerweb.com. In the lines 57-59 we remove the Chrome’s border around active fields. I have defined other focus rules for active fields. Focus is needed for highlighting active elements especially when the user interacts with the page using the keyboard. In the lines 63-66 we disable the background and the border of input fields for using custom backgrounds. The rest of the CSS file is pretty simple. We style the container, the form, the welcome page, the input fields, the text and the footer. Here I used the PSD file to find the right space between the elements. The solution consists in hiding the default checkbox (lines 175-178) and styling the label using CSS3 selectors and pseudo-classes (lines 180-203). “input[type=”checkbox”] + label” means a label that is immediately preceded by a checkbox. As mentioned above, I have used the selectivizr library for Internet Explorer 6, 7, 8 that don’t support CSS3. I have tested this solution in Chrome 16, Firefox 8 and Internet Explorer 8 (no CSS3) and it works fine, with some slight differences between the browsers. Try it and let me know what you think. Your feedback will be very appreciated. For the selectivizr and jQuery libraries use their licenses. I am wondering how you got all this values. so, the width and height in the css file is the same width and height of the png image (username-field.png). For the margins I used the Guides in Photoshop and then I tried 2 or 3 different values (increasing or decreasing by 1 or 2 pixels) until I liked the result. i need to use ur login form in my asp.net website.. but how can i make validations on the textbox about the required fied validator & to check the username & password with database.. if matches thn to access the welcome page ?? I’m sorry but I can’t help you. I don’t know asp, I’ve never used it. Hope you find a solution. Hi there! I am trying to implement this into SMF, which uses PHP and css, but I am experiencing some problems with getting it to work. I am using SMF 2.0.2 if that helps. Have you ever modified this awesome login form for that? Hi Pete! No, I have never used SMF, sorry. It’s a nice post for beginners. Good morning, After an intensive search I came across this log in, It is beautifully design, I’m farely new to Web design and I’m in the process of learning HTML and CSS. I would like to implement this on my site, However, I’m not sure I understand how to link this page to the rest of my site. Is there an instruction page on how to make it part of my site and also, how do I tell the form to check for the correct login and password when someone attempts to access the page. One last question, how do I create the various login and passwords. This login form looks very simple and beautiful.. I will use it for my site.. thank you!! !